Engineering students get a lesson from their instructor, Nick Steffen, Tuesday in the new engineering program lab. The lab is one of the corners of the new wing of the Consolidated Campus and boasts four different spaces for labs, classrooms and workspaces. 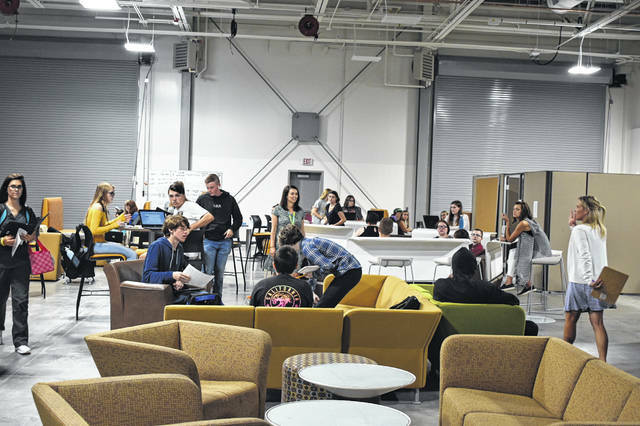 Students study and relax in a temporary education space that will eventually be the Auto Collision lab when North Campus programs move to the Consolidated Campus next August. Many programs at the Delaware Area Career Center’s South Campus moved into their new permanent spaces when classes began last week. The DACC Board of Education approved plans to consolidate the North Campus and South Campus in 2014, and construction on the new wing of the consolidated campus at 4565 Columbus Pike in Delaware began in 2016. 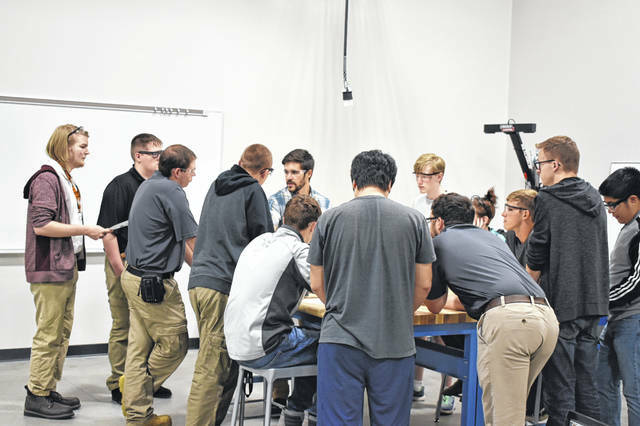 The new wing’s high-bay labs will house many North Campus programs such as construction and auto collision, but for the time being, they are serving as classroom spaces while the existing South Campus building is renovated. The consolidated campus will open with both North Campus and South Campus programs next August. However, some programs such as App Development, Networking, Digital Design and Engineering began the semester in their new permanent labs. Engineering Instructor Adam Paisie said the new engineering space is four different rooms and includes workspaces, a computer lab and a classroom. Paisie said engineering used to be spread across two classrooms that weren’t near each other, meaning students had to walk down the hall to a different room to work on certain projects. “I love this new space,” Paisie said on Tuesday. The engineering program is a three-year program at the DACC, and Paisie said having four areas for the program is great because it means the DACC can separate the classes by grade level. “They are separated, but it makes it very easy to collaborate,” Paisie said. The new area is much larger than the previous areas, Paisie added, which means that the course can actually use all of its equipment. “For the first time in three years, we can use purchases we made last year but had no space for,” Paisie said. Engineering students said they enjoy the new space as well and are looking forward to learning in the new areas. “It’s a lot more open,” said Joshua Schwaigert, a senior in the program. Jordan Koebel, also a senior, agreed. “It feels a lot better,” he said. “There’s more room to move around. It’s cool to glance at other engineering students that aren’t in our class. Kaleb Beddoes, a senior, said he likes the layout that keeps the classrooms connected, but keeps the grade levels separated. “It’s cool to have individual labs so we don’t have to deal with sophomore stuff,” Beddoes laughed.